I'm currently canvassing local libraries to see how customers interact with and use their library. After several days of observing, I've become very familiar with the dazed and confused look. If you work in an area near the front entrance of your library, you may be familiar with it, too. and decides he'll have to figure it out for himself. In this scenario, how well equipped is your building to provide the customer service? Large signs over areas help customers identify sections of the library. After working in a library for so long, you take for granted how familiar you have become with the building around you. In my post Rate Your Library, I talk about observing your library from an outsider's perspective. 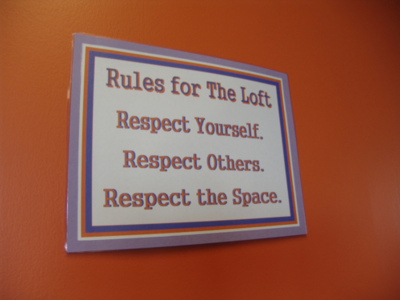 When contemplating what signs to use and where to put them, it is imperative to take the customer's point of view into consideration. For example, to the trained eye, it is obvious where the children's books are kept because the shelves are lower and, usually, there is kid friendly furniture. To the newcomer, however, shelves are shelves and furniture is furniture. Without a sign designating that the area is indeed for children, a new library customer may feel lost. Using too many words means no one is reading. 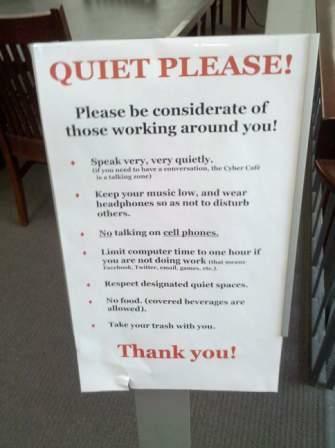 The sign on the left was clearly made out of exasperation of having to talk repeatedly to library visitors about noise levels - a rule that should go without saying. The sign on the right, however, uses few words, packs a punch, and maintains a professional tone. The idea behind great signage is saying what you mean in as few words as possible. Pictures work great to convey concepts and should be used to replace words when possible. Before putting up a sign, think about what you are trying to achieve. Signs should provide a good back up for customer service and not try to do your job for you - they will never be as good at it. If creating signs are not your cup of tea, then I highly recommend Graphic Design for Non-Designers by Tony Seddon. One of the secrets of major retailers is the ability to brand. You can walk into a Target in any part of the country and, even though the layout may be different, the signs and color scheme are the same for every store. This little touch makes customers feel comfortable and more inclined to shop. Mexico's libraries are undergoing this very concept by using the same fonts and color schemes for signs. The signs are being manufactured centrally and sent to each of the libraries around the country. Branch library systems can capitalize on this idea of branding by making consistent signage across the system. By using this branding technique, library customers will feel welcomed by the familiarity of signs even if they have never stepped foot in that location. There is a lot to think about here. Try taking a stroll through your library and inventory the amount of signs. Which ones work and which ones don't? Are the signs cohesive by using the same font style and color? Making small, simple changes can have a powerful effect on the appearance of your library. Why not start with a sign?